View More In Makeup Sets. A high-quality mini fridge, just like in cute dollhouses!. 2. 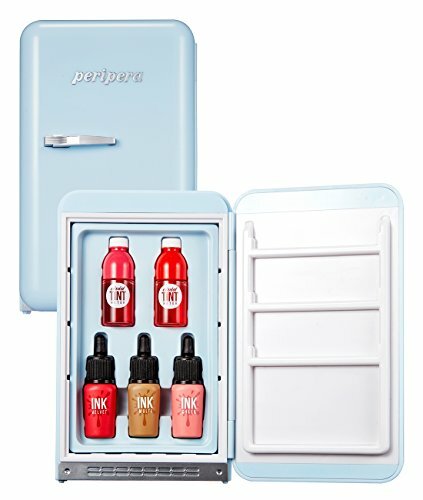 Get Ready for Summer with a Fridge!. Hard-carry Makeup from Lip to Blusher. - Tint for soft, vivid and lovely lips. - Liquid blusher and multi-shadow for complexion+shading=vivid juicy look. 3. Unique D.I.Y. Fridge with Sweet Miniatures. PERIPERA added fridge shelves, sweet food & stickers for you to fill 01 Sweet Pink and 02 Sweet Blue fridges with Peri's sweet foods. [PERIPERA Ink The Velvet 16 Vivid Coral Red] (NEW Limited). No more worries about tone!. Pinkish coral red color with a single drop of pink in coral red brightens your face. [PERIPERA Ink Liquid Cheek #Flushed Peach Pink] (NEW Limited). Glowing juicy peach color with shy peach pink color and sparkling gold pearls added. [PERIPERA Vivid Tint Water #2, #6]. Vivid Tint Water #2 Peach Squeeze. Vivid Tint Water #6 Pink Lemon Squeeze. Enjoy free shipping on orders over $70.00 / This is Clubclio's direct management shop's Korean head office. Volume : 0.12 x 0.07 , 0.09 x 0.10 Ounce / Manufacturing date is printed on packaging / Use within 12 months of opening. The product results may vary depending on your skin tone and type. / The color displayed may vary depending on your screen. If you have any questions about this product by Peripera, contact us by completing and submitting the form below. If you are looking for a specif part number, please include it with your message.